This video will take a close look at three-phase power and explain how it works. Three-phase power can be defined as the common method of alternating current power generation, transmission, and distribution. It is a type of polyphase system, and is the most common method used by electric grids worldwide to transfer power. Welcome to this animated video that will quickly explain 3 phase power. I’ll also explain the mystery behind why the 3 power lines are 120 degrees apart because that’s a crucial piece to understanding 3 phase power. The power that enters a data center is usually 3 phase AC power, which means 3 phase alternating current power. Let’s look at a simplified example of how 3 phase power is generated. This example is different from what I would use to describe how a three phase motor uses power. In the alternating current video, we showed how spinning a magnet past one wire caused the current to flow back and forth. Now we’re going to spin a magnet past 3 wires and see the effect that has on the current in each wire. In this three phase example, the north positive end of the magnet is pointing straight up at line one. To help explain the concept easier, let's use a clock face and say that line one is at the twelve o'clock position. The electrons in line 1 are going to be flowing towards the north pole of the magnet. What happens when the magnet now swings 90 degrees? As we saw in the alternating current video, because the magnet is perpendicular to line 1, the electrons in line one will stop moving. Then as the magnet swings more than 90 degrees and the south pole of the magnet comes closer to line one, and the electrons will reverse which means the direction of the current will reverse. That was described in detail in the alternating current video. If you clicked on this video without a thorough understanding of alternating current, please view that video first. Looking at the chart, you can see why I picked an analog clock face. A circle is 360 degrees and the clock divides the circle into 12 sections so that each hour covers 30 degrees of the circle. Going from 12 to 3 is 90 degrees and going from 12 to 4 is 120 degrees. When generating 3 phase power, the copper lines are located 120 degrees apart. So when you're at the four o'clock position in our example here, that's 120 degrees away from line one. And at the eight o’clock position is 120 degrees away from both the 4 and 12 o’clock positions. The 3 lines are equally spaced around the circle. If the north pole is closer to one of the 3 wires, then the electrons move in that direction. The closer the south pole gets to each wire, the more the electrons move away from the south pole. In each three of these lines, as the electrons are moving back and forth, they are not always moving in the same direction or speed as the other two lines. Let’s look again at the example. As the magnet is spinning, when the north pole is at 1 o’clock it becomes perpendicular to line 2 so of course the electrons stop moving in line 2. But they are still moving in line 1 attracted by the closer north pole and they are moving in line 3 repelled by the south pole. When the magnet’s north pole faces 2 o’clock, then Line 1 and [Line] 2 are affected by the north pole but the south pole is directly opposite Line 3 so it’s now at peak current. At 3 o’clock, the magnet is perpendicular to Line 1 so electrons stop moving, but Line 2 is affected by the north pole and line 3 is affected by the south pole so current is flowing in lines 2 and 3. Hopefully this example shows you how at any time current is always flowing in at least 2 lines. It also shows the relationship between the 3 lines as the magnet spins in a circle. 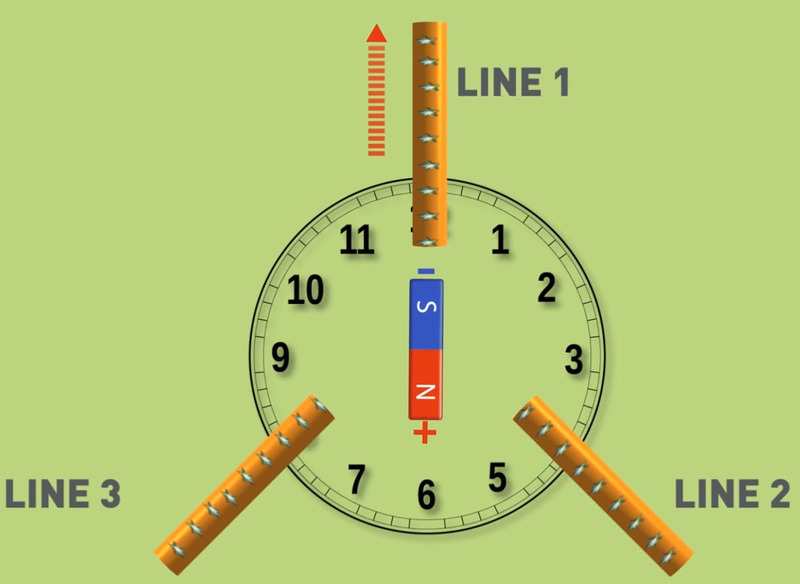 As the magnet goes around the clock face, each of the 3 lines will be affected by either the north or south poles, except when the magnet is perpendicular to a line. Let’s focus on line 1. It's at its peak current when the north pole points to both 12 and 6 o’clock positions. It is at zero current when the north pole points to 3 and 9 o’clock. Only 1 of the 3 lines is ever at peak, but because there are 3 lines, there are 3 peak positive and 3 peak negative positions for every cycle. At 6 different positions on the clock face, one of the lines is at peak. 12 and 6 positions are Line 1's alternating peaks, 2 and 8 positions are Line 3’s alternating peaks, and 4 and 10 are Line 2’s alternating peaks. Now let’s explain those confusing waveforms that are frequently used to depict 3 phase. If you look at the wave form example you can see the first line in blue, and it starts at zero. Which means the magnet is perpendicular to that line. As the magnet moves, you can see the current go to its peak. Then as the positive pole spins past that wire, the current starts to weaken until the magnet is perpendicular again which results in zero current. As the negative pole starts to come closer, the current reverses and moves in the other direction towards another peak before returning to zero current. This completes 1 full cycle for that line. In order for the 2 dimensional chart to show the relationship between the lines, it now shows a gap that signifies the length of time it takes the magnet to spin 120 degrees. This is when the red line is at zero current. As the magnet keeps spinning, the red line will move towards its peak positive current, then come back to zero after which the current will change direction. The chart also shows that the third line will start at zero current 120 degrees after the 2nd line. So if you look at these 3 lines, you can see that when one line is at its peak the other 2 lines are still generating current, but they’re not at full strength, meaning they’re not at peak. So as the electrons flow from a positive to a negative peak, the current is displayed as flowing from positive to negative values. Remember that positives and negatives don't cancel each other out. The positive and negative connotation is only used to describe how current alternates. In a 3 phase circuit, you usually take the one of the 3 current carrying lines and connect it to another of the 3 current carrying lines. One exception to doing this is described in the Delta versus Wye video. As an example, let’s use a 3 phase 208 volt line. Each of the 3 lines will be carrying 120 volts. If you look at the chart, you can easily see the power output of any 2 lines. If one is at peak, the other line isn’t at peak. That’s why in a 3 phase circuit it’s incorrect to multiply 120 volts times 2 to get 240 volts. So if you’re wondering why you have 110/120 volts at home for your regular outlets, but you've also have 220/240 volt appliances, what gives? Well, that's not 3 phase power. It's actually 2 single phase lines. So how do you calculate the power of combining 2 lines in a 3 phase circuit? The formula is volts times the square root of 3, which happens to be rounded off to 1.732. For 2 lines each carrying 120 volts, the calculation for this is 120 volts times 1.732, and the result is rounded up to 208 volts. That’s why we call it a 208 volt three phase circuit, or a 208 volt 3 phase line. A 400 volt three phase circuit means that each of the 3 lines are carrying 230 volts. Last topic I'll talk about in this video is: why do companies and data centers use 3 phase? Right now let me give you a simple overview. For three phase, you connect line 1 to line 2 and get 208 volts. At the same time you [can] connect line 2 to line 3 and get 208 volts. And you [can] connect line 3 to line 1 and get 208 volts. If the wire is capable of delivering 30 amps, then the power that’s being delivered is 208 volts times 30 amps times 1.732 for total power available of 10.8 kVA. In comparison, for a single phase 30 amp circuit carrying 208 volts, you will only get 6.2 kVA. Basically, 3 phase delivers more power. There are other factors why it’s far better to run 3 phase power to the data center rack rather than using single phase power, and those factors are discussed in the volts versus amps video and also in the 208 versus 400 volts video. Learn more about our innovative power capabilities.